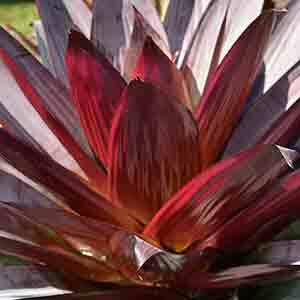 Alcantarea are a tall growing group of bromeliads reaching up to 2m depending on species. Alcantarea imperialis, geniculata, extensa, edmondoi and vinicolor are all popular species readily available for sale. The genus Alcantarea is still being defined however they are a genus of perhaps only 20 species and are closely closely related to Vriesea. Alcantarea imperialis is perhaps the largest and best known of the species, growing up to nearly 2m and known as the ‘imperial bromeliad’. This species does well in a large pot and prefers a well drained potting mix along with some afternoon shade. A. imperialia rubra has red foliage as the name suggests, upright with a tall flower spike to 3m+. If you grow from seed you may get a different looking plant in terms of color as the species is variable. Most species are from Brazil and many grow in the mountains so they can stand cooler night temperatures. The only real problem is that the taller growers as they get really tall, can fall over. Alcantarea imperialis ‘Silver Plum’ with its brilliant red foliage is perhaps one of the most outstanding landscaping varieties. Look for species such as the smaller growing A. vinicolor, a smaller growing type that grows well in a sunny position. A. odorata is an interesting species with lighter grey / green leaves that are, as the name suggests, fragrant and droop nicely, looks great in a pot or container. Other Populular species include : A. regina, A. geniculata, A.extensa, A. heloisae, A.glaziouna and A.brasiliana, many available for sale from specialist growers.